Everyone Loves a Golf Contest! Contest Excitement - Your sponsors’ name and logo will span this popular guest experience. Amateurs and pros alike will relish testing their drives and accuracy, swinging real clubs. Drive distance contests will run every 10 minutes, with the winner receiving your prize of your choice. Contest prize is not included in the price below. 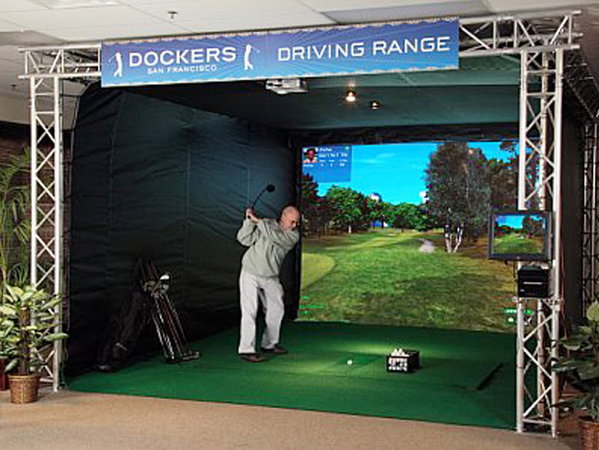 The virtual screen is a photo of a real golf course. Drive Booth Traffic - Golf Challenge will drive attendee foot traffic. A golf scorecard will be given to every attendee and must be validated at the sponsor’s booth. The golf scorecard will include: sponsor’s name, booth number and messaging. Bold signage will be seen by all attendees promoting the sponsor, contest and a contest leaders of the long ball. Qualified Sales Leads – All participants must answer sales qualifying questions to participate. Surveys are administered on iPads kiosk. You create the questions, we report them. Brand Immersion - Each guest spends 10 minutes at you’re promotion. Your message will be heard and remembered.